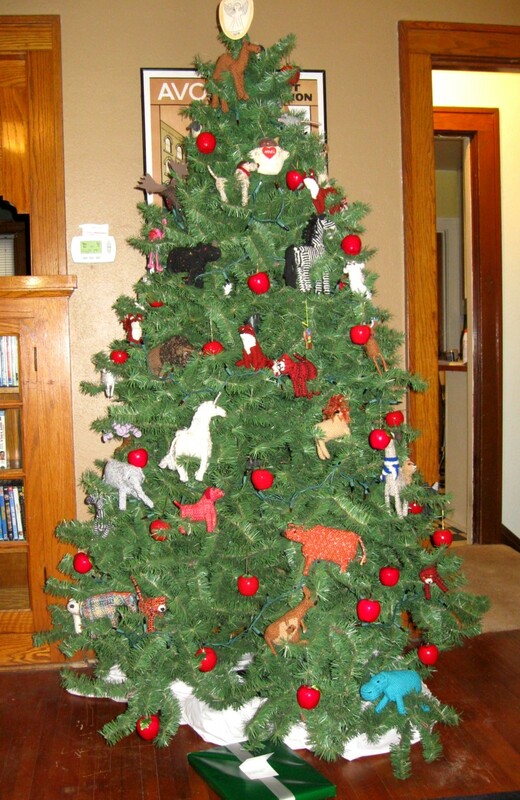 We're now deep into gift giving season and I am faced with a frustrating situation. I am surrounded by loving family who don't really need anything new for Christmas. They are all independent enough and old enough to go out and get whatever it is they need or want. Since I can't go out and buy them fabulously extravagant gifts, (I mean, its not like they would turn down a trip around the Mediterranean) I am hoping to send my best greetings of the season with something handmade and heartfelt and pretty. 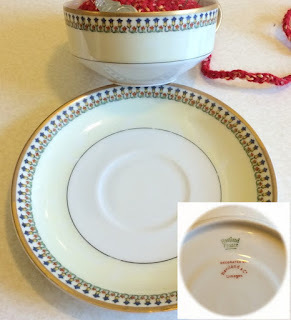 This gift started with a tea cup and saucer that likely began life as part of a lovely set of china and ended with my discovery at a local thrift shop. I found four cups and saucers and took them home in much the same spirit as a friend of mine adopts kittens. Its not that she needs more kittens, she just can't bear to leave them behind. I couldn't stand to leave the tea cups and saucers even though I had no idea what to do with them. I did a search on uses for tea cups. Number one idea was candles, number two was pincushions. I went for the one that I could weave. After further research I found that the best stuffing for pincushions is ground walnut shells and that the easiest place to find ground walnut shells is at the pet store. They use it as bedding for reptiles. Now all I needed was the pincushion cover. 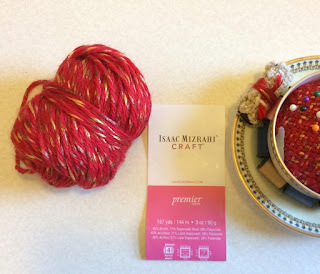 I wanted a festive looking yarn that would match the tea cups. Since each cup has a gold handle and edging, this craft yarn by Isaac Mizrahi seemed like a good match. This is a wool/acrylic worsted weight yarn with gold accent. I wove two 4" x 4" pin loom squares on the Zoom Loom and used a single crochet edge with slip stitch at corners to join the two layers. 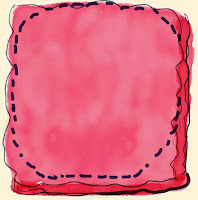 You could also choose to join the squares using a back stitch. When you join them, leave an opening on one side. Turn the squares inside out. Use a piece of t-shirt to line the inside if you are going to use ground walnut shells for the pincushion. You don't have to stitch the lining, just overlap the sides and the ground walnut shells will keep the lining in place. Fill with ground walnut shells. Instead of the ground shells, you can use your choice of polyester or wool stuffing. No lining is needed with regular stuffing. 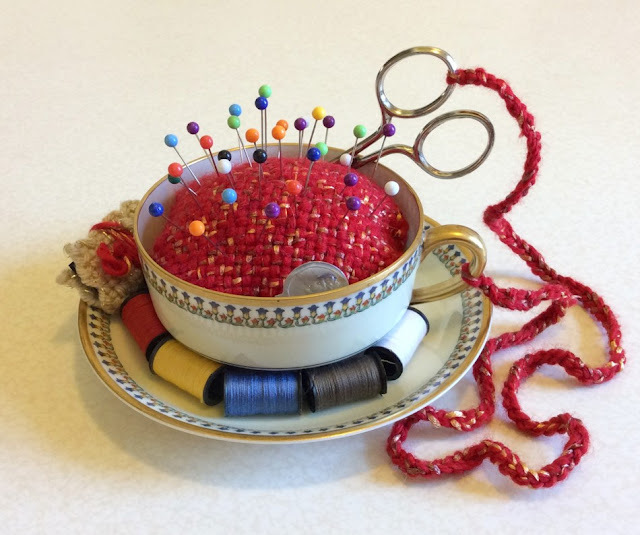 Attach the pincushion to the bottom of the teacup with adhesive. I used E6000 because it works with glass or china. I could have stopped there, but, as an old friend used to say, "Anything worth doing is worth doing to excess." 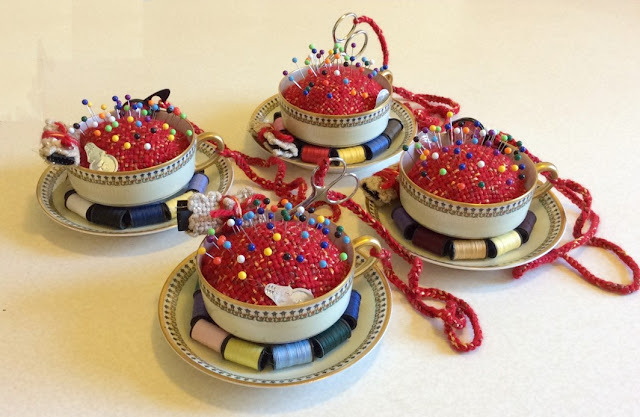 I was no longer interested in simply making a pincushion. Now I wanted to create a total teacup-sized sewing package. Obviously a pincushion needs pins. In addition I added a selection of small spools of thread, a needle threader, a package of needles enclosed within a 2" x 2" square and either scissors or a thread cutter attached to the cup with about 18" of single chain crochet. I like the idea of a sewing set with everything you need in one place. I put the scissors on a chain because if it were me, I would totally lose the scissors the first time I used them. I'm hoping that this will bring new life to these teacups for a number of years, sitting someplace handy, not taking up too much space, ready to assist with snags and loose buttons. Is this the best possible use for abandoned teacups? Perhaps it is, or perhaps my relatives will be getting candles next year. 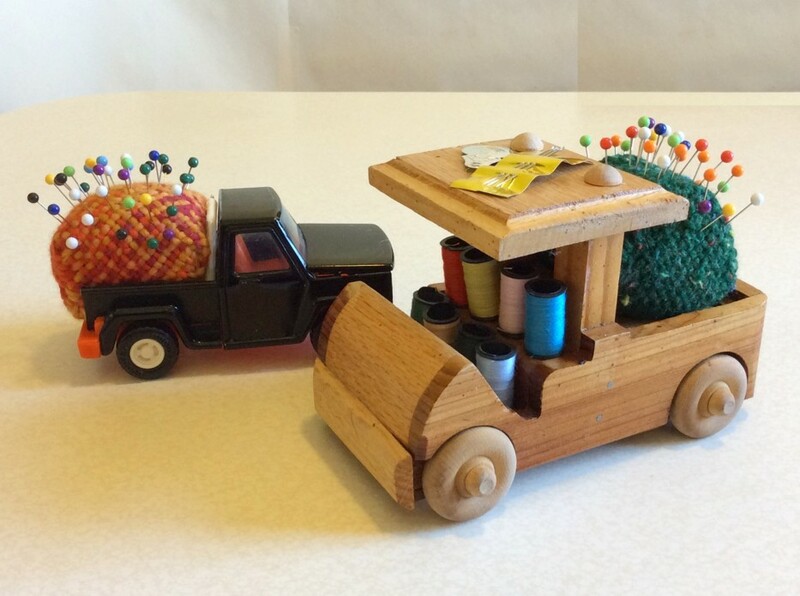 Of course teacups are not the only vehicle for pincushions. There are a lot of other thrift store finds that will work as well. My plans for these vehicles are just getting under way. 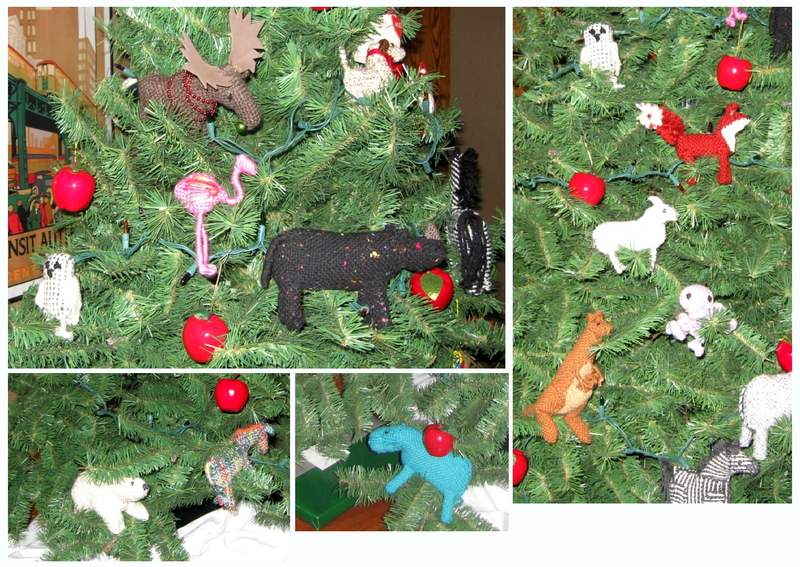 I still have to figure out the best approach for including the rest of the sewing items. I will update this post with more pincushion pictures when these project are complete. 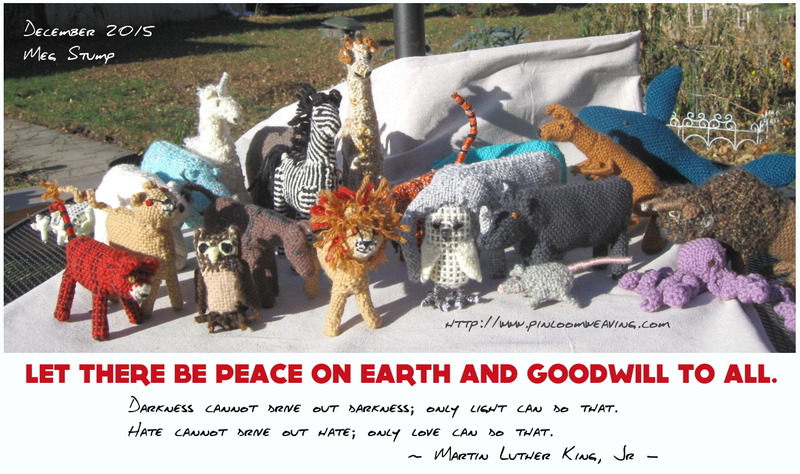 This idea came about because I had some interesting yarn sent to me from an ancient stash. The hooded scarf was woven on a 6" x 6" pin loom and a 4" x 6" pin loom. 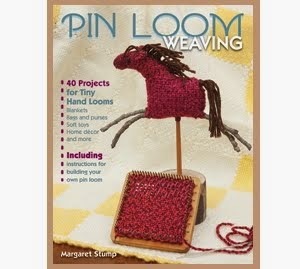 It could as easily be woven on a 4" x 4" pin loom, like the Zoom Loom. There are diagrams for both patterns below. This hooded scarf was woven from Unger Driftwood-- a two-ply yarn; one thick ply and one very thin ply that seemed to be there only to give the yarn some texture. The yarn is a medium gray with bits of color spun in at random intervals. Please note, this pattern shows one-half of the hooded scarf. You will need to weave this pattern two times, in other words, 4) 4" x 6" rectangles and 12) 6" x 6" squares for the complete scarf. If you are weaving with a 4" pin loom you will need to weave 42) 4" x 4" squares. 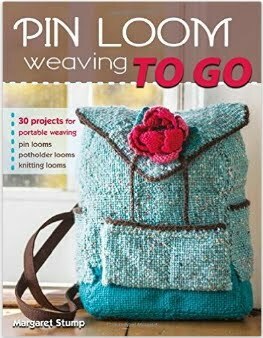 the scarf is joined using a mattress stitch, which you will find directions for on the Pin Loom Essentials page. The ribs are formed when you slide the needle through the warp without weaving. This produces a lump of three weft threads clustered together. This pattern can shorten up the cloth a little but it makes a nice texture, particularly for an item where you want to have some weight of cloth to keep out the cold and damp. Triple Rib Pattern for 4" and 6" pin loom. 3. Slide needle through threads without weaving. 5. Slide needle through threads without weaving. 7. Slide needle through threads without weaving. 10. Slide needle through threads without weaving. 12. Slide needle through threads without weaving. 14. Slide needle through threads without weaving. CONTINUE FOR 6" LENGTH LOOM. 17. Slide needle through threads without weaving. 19. Slide needle through threads without weaving. 21. Slide needle through threads without weaving. Join the squares using a mattress stitch. If you have already checked on this joining approach, you know that this stitch allows you to very quickly join two squares. Because this is a relatively small, lightweight item, the mattress stitch, which is a lightweight stitch, seems to work very well. Full the cloth by hand washing with a wool fiber approved product or shampoo. I keep of bottle of sensitive style shampoo around just so that I can easily finish my pin loom items. 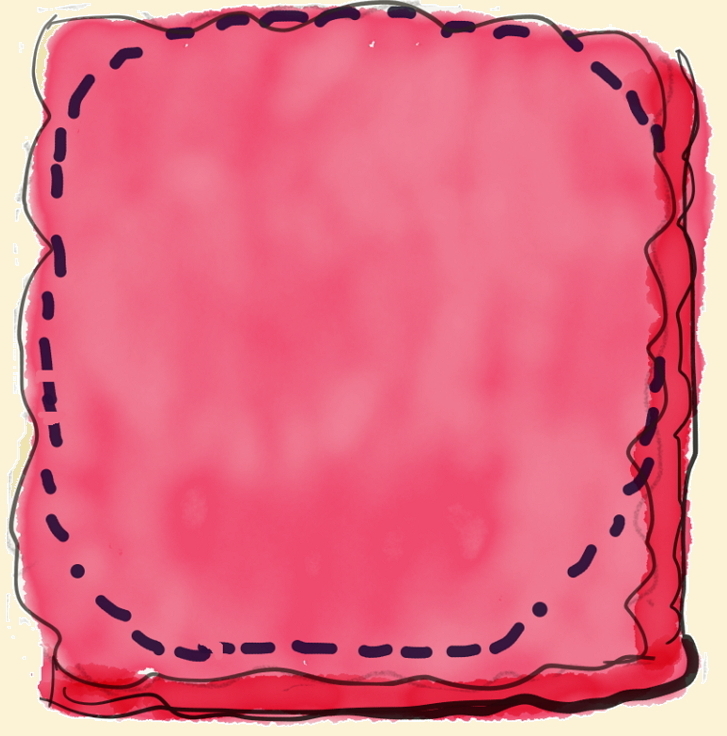 Washing the scarf will bring about some shrinkage and will let the fibers bind together more securely. I wanted a hooded scarf that would stand up to sleet and snow and cold, wet weather and this one works beautifully. I have come to see that the style is as old as time, people were probably wearing something a lot like this since the beginning of weaving. I am also a bit surprised that the woven squares don't particularly stand out. I realize that all of us who weave regularly on pin looms could easily pick out the joins and would know that this hooded scarf was woven on a pin loom, but I think that most people would not realize that it was pieced together. And most important to me was that it wove up very quickly, had a lovely texture that matched the yarn and was sewn up just as quick. I have now made a couple of these hooded scarves and have found them to make a usable, reasonable gift. 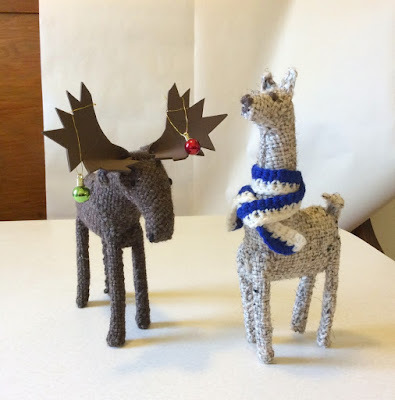 So as we enter the season of gift frenzy, if you are looking for a handmade gift with a twist-- not exactly a hat but more than a scarf-- perhaps this will be just perfect.